Hm... seems like I forgot something when I posted the 3rd book but not the 2nd's book review... Yea, I'm organized like that. So here is the review of the second book. The first book is The Shadow Revolution and the third book in the trilogy is The Conquering Dark (both reviews linked in the title). This is a trilogy so I recommend reading these books in order. This book builds on the last and I think you won't be as involved with the characters if you didn't read the first book. Plus, I do think that although I really enjoyed the adventure and mystery, I enjoyed the characters even more. This one is just your typical day for the group when they have to save the world AGAIN. However, the mystery of the first book bleeds into this one hen we are up against an impossible enemy. As in the first book, twists abound and we are left with something I didn't expect. There is a small cliffie for the ending, but nothing one can't handle especially knowing the next book is the last. I so can't wait to see how they fix something they didn't know could be broken. I give this book 4 stars and highly recommend it to those that enjoy mystery, intrigue and a bit of steampunk. I'm catching up on my BEA books and this series is on my list once I do. Oh I do think you'll enjoy it! The characters were definitely the best part of this series! Oh this series is right up your alley! 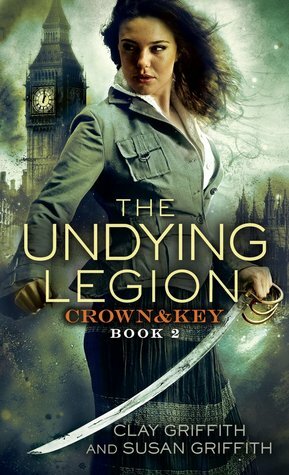 I have the first on my wish list, I am excited to read this series! I think you'll love this one! I kept eyeing this one at the library, but my arms were already full so I will have to wait and get this one later. Glad to know that the cliffie isn't bad. Who me??? 0;-) <- innocent, I tell ya! I think you'll have fun with this one. Everyone is loving this series, I bought the first book awhile back, and I really need to read it. So need to read the series!! I just started book one on audio and I'm really enjoying it so far! The narration is really good and I already love the characters. I can't wait to learn more about this world! Oh audio... I bet it is good on audio! This sounds like a cool series! I wish there's another book or even a spin off with Penni, Charlotte and Malcolm! You will love the third book and will clamor for more! Hehhe..saving the world again..just another day at the office. I enjoyed this one and book three is good..so enjoy! Everyone is loving this series, I'll really have to try it! It sounds so good! You must've been too excited to post in order. lol. Glad they all rocked, because I plan to read these soon. Sounds like a good follow up read in the series. Thanks for the heads up about starting at the beginning. Though I've promised myself not to begin any more books that form a series as this is only a trilogy and has so many elements that intrigue me I'll be certain to add the books to my wish list. Reading series in order is a MUST. I hate when I accidentally stumble on a book that's part of a series but I didn't realize it. It makes me feel all out of sorts.